Gage Kent and his son Jimmy in Washington, D.C. 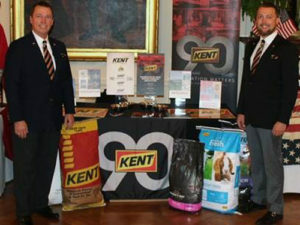 The two leaders of an Iowa feed company were part of a “Made In America” showcase at the White House Monday. Kent Corporation CEO, Gage Kent, says his company of the only one from Iowa and the only ag company that was part of the event. Kent says he talked directly with the president about the concerns of the ag industry and has faith that the concerns about trade issues are going to be worked out. “In general, I think everyone in ag needs to put their faith in the negotiators. It’s not been a level playing field for decades, and the administration is endeavoring to readjust and make a better deal for America,” Kent says. He says he understands the concerns of farmers and business owners but says changing the trade imbalance is not a quick fix. “That takes a little bit of time and a little bit of patience, ” Kent says. “But we have probably the best negotiators in the administration — arguably in my view — than we’ve had in decades.” Kent’s grandfather started the Muscatine-based business 90 years ago and he says they now do business across the globe selling animal feed and other products. He says his company has not noticed issues yet with the trade tariffs but knows there are concerns out there. “As far as our businesses are concerned, we have seen frankly from some of our trading partners the same sort of concern in the converse as to what’s going to happen,” according to Kent. “But the picture is still not painted yet, I guess.” Kent and his son Jimmy Kent, who is the company’s president, both talked with other businessmen during the event. “I think the key take away that we go home with is that there’s more optimism among manufacturers, there’s more optimism in D-C, and there’s just an energy in the economy right now thanks to the president and the administration and to the cooperation of congress to putting American on a level playing field with the rest of the world and letting us compete,” Kent says. Kent says President Trump highlighted the importance he has for farmers by throwing green hats that said: “Making farmers great again,” into the crowd at the event. Kent Corporation is privately-owned and has nearly 2,000 employees throughout its 23 locations across 13 states.